Better Budgeting: Easy Baked Apples - In The Microwave! Easy Baked Apples - In The Microwave! 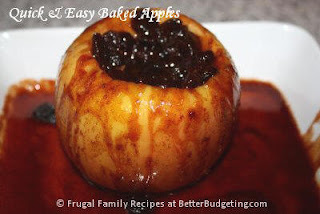 Baked apples are easy to make, easy on the budget, and a delicious healthy treat! When you were a child, your mom probably made them for you in the oven and cleanup was a bit of a mess. Now you can make them with just a few ingredients and in just a few minutes...in the MICROWAVE! TIP: For easy cleanup coat dish with cooking spray. The scooped out part is just the right size to hold the toppings--saving plenty of the apple for eating--that's the healthy part we want to keep! Next, in a small bowl, combine together approximately 2 tsp. butter, 2 tsp. brown sugar, 2 tsp. 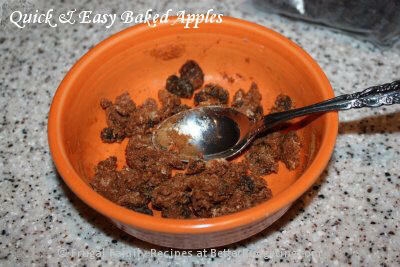 raisins and 1/4 tsp. of cinnamon. 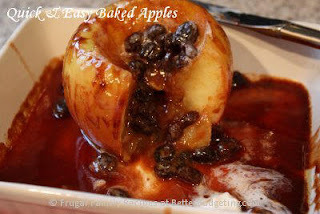 For the apple in these photos I was a little more generous with the ingredients. 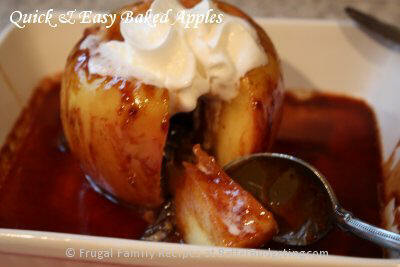 I used about a Tablespoon of everything (except for the cinnamon, I used about 1 tsp. ), then tossed it all together in less than a minute. The amounts you use are really up to you. 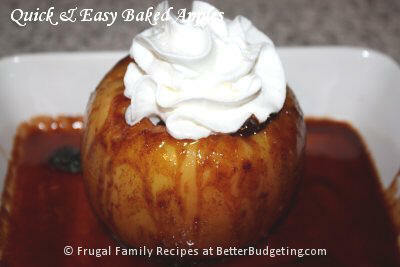 Remember, these are QUICK and EASY Baked Apples... no measuring required! 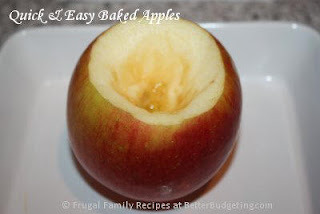 Fill the apple with the butter mixture and place in a microwave safe dish, cover with a small sheet of waxed paper and cook on high for 3 minutes. The apple and bowl will be hot, so let it cool before serving. Serve these delicious baked apples either whole or cut into bite size pieces. As you can see from this photo, my 'generous' toppings overflowed into the dish. 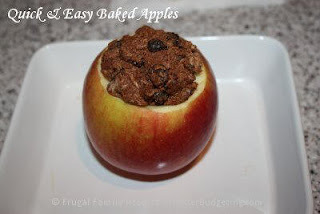 After cooking in the microwave for just three minutes, not only will all the gooey stuff be melted over the apple, but the inside will soft and warm, just like regular baked apples in the oven. This large apple could easily be split between two, or even three, people. Copyright © 2001, 2006, 2013 by Michelle Jones. All rights reserved.